Mentagon & JhonRabe & Sexyhit are not offer frauders they have payed to some trial offer to get points PLEASE UNBLOCK THEM!!! Hide 139 comments... Click to show. Why You blocking us guys? my friend. mentagon and jhonrabe WHY? Nice, and congrats on the Aeria games music Video contest. Keep it up!! Another contest, Monster Slayer, you may be interested in. Check out this Monster Slayer Guide! wow samuel how'd you do it? Congratulations on your 2nd place in the Summer beats gone by contest! you got 2000 fanbucks + a fantastic Aeriagames T-shirt for your avatar + a real Fanup t-shirt ready to be sent to you (only US and EU)1!! how you get 10k fancoins? Mhh congratz on 3thd place, a question... did you have got your fanbucks? I upload all my images onto my PB account on server so I can dont copy and paste but rather using the actual image button and the edit it from there. *so I don't C&P but rather using the actual image button and edit from there > PB = Photobucket. Samuelrock00, I've decided to give you a runner up prize for last weeks contest only because those last two guides got missed, you still would have come in 4th place over all for a couple reasons. 1st you're guides have only a fraction of the text that the other winners had, 2nd I'm always having to fix your images even thought I'm sure I've told you how you can change them yourself. I'm always willing to work out something if you have an issue, but posting negative comments on the site isn't the way to get anyone to help you. Next time send a message to Jaryd@FanUp and we'll talk it out. HardStyle posted the most guides this week, so rightly has come first. Exerath posted 2 superb guides - with the new designs.. so most likely got some extra FanCoins and managed to get 2nd. I understand your frustration as I know you make quality guides but if all your guides got accepted it's most likely you would have come first. To brand Splooshi as lazy is a bit unfair, considering what you haven't seen what he has to say + he's a busy man. I think you've jumped to a conclusion without the full facts. Splooshi hasn't done anything wrong, I created 1 guide which was the Ultimate Guide. All I asked was instead of making a brand new guide, that it is put in the place of the old one. It would be pointless to have two guides of the same thing. I was rewarded for this (as it is a "new" guide) and I got more than the 800+ FanCoins (which you had) which is probably why I came 3rd. This is from my perspective so I apologise if I've got it wrong, but that is how it appears to me. Stop say that my guide is copied because he is too good that you can do the same... :D Only the colour of font can be copied from here: http://www.mobafire.com/league-of-legends/build/nihilistic-nasus-134030 but colour isnt copyright then try to the some quality guides like mine before post some idiot critics! Welcome back to Fanup!! You are still eligible to participate in all kinds of OFFICIAL contests provided by the website. They're fun, check them out!!! Oh ty guys I wasn't even here on saturday lool for the whole day. Make sure you format your guides well :) It seems to be a bit out of position. This happens alot if you copy from word onto the guide. You have to reformat the page again, using the editing functions. I'm sure you do, but preview your work before, and expand it to the same size of how it would look on the site, this should give you an indication of how your guide will look. What I mean by this is, when you create your work and adjusted where everything should be or look like (i.e middle of the page or right of the page, bold or italics e.t.c), then preview your work as it will tell you how it will actually look like. Sometimes, when you have formatted your work, it still shows like how it use to be before your formatted it, so you have to format it again (i.e You put a picture to be in the middle page and it's still on the right), that is what I mean't by reformat. I've seen the comment and taken note. Thanks. I think a bit more maturity is needed here. This current contest is one of the best FanUp has given with top prizes. There should be a positive vibe around it. If there is anything you want looked at or report then.. send a message to community@fanup.com or speak to a Guardian about it. These messages back and fourth are not productive and not helpful. As they say "Can't we all get along..."
Alright, but I'm just trying to make the contest a fair win. Samuel, please don't rage on vegeta, contact a guardian such as me. Please don't talk further about this subject, I want you guys to stop and settle it, like an adult. Also, be calmer with your language. Don't rage. Okay, but don't need to say it twice about "Stop raging". Just Like I said to "Advance" I just want this to be a fair win. IDC bro contact Fanup your video is copied. Cause I have a life every heard of that? excuse me I mean "EVER"
in the screenshot u have beat my clan alone?? they have all 3 a sd between 1.5 and 2.0 how did u do?? Luck? and no i aint lucky I am pro ask anybody. What screenshot? Give me URL. Nahh I always post a guide on Saturday's no luck qq. Also this isn't spam and I don't really care about these 750 coins, I have answered comments and questions posted screenshots and this will be only 1/10 of my final score also don't think that I spam please! Im 100% Legit here! PS: Think next time to unlink the items from mobafire and LoL Wikia...because we can see really from where is your source..
What website do you go to then huh? Your guides "Ashe Review" and "G36 ALLIGATOR" need work before they can be approved. They look very sloppy. I don't have skype so ill email you. Samuel. You can still edit your guides after you submitted them. samuelrock00, i saw that you asking for 'master guide smith' badge on you guides.Please understand that, you will be awarded that badge when the Admin think that you deserve it. Adding a request to guides really reduces its quality ! Hey samuelrock00, just letting you know that in the future if you submit copied material you need to state that at the bottom of the guide and give credit to the author, I let a couple past before but we have to be honest to the people putting in hard work writing these guides. Please stop spamming since you won't win the contest like this. puedes irte un largo rato a la conchetumadre disculpa. Why did you disqualify me on contest? Please post or comment in appropriate Englist or other languages like not typing the short forms of them. I write the long forms of them, then show the Short forms. But some of the posts doesn't show. Its just a tip, nothing so serious since you can ignore my advice. is the new week started yet :? vohooo highest ever fan coins 1400 vohoooo!!!! Just sayin', don't make guides on guns you don't have. As I see on some of your guides: There's like not much, but all what says is based on stat-only. That's what I mean. Get those guns if you want a guide.... seriously. Last thing: THe content in your guide isn't right. (sometimes even false) ex. P90 has a decent damage for a SMG tad on the low side. But definitely isn't a waterpistol, MP7A1/MP5K = waterpistols. wht ijji game do u play??? Im almost 14. Get your facts straight please. BTW I'm trying to get Fanbucks not coins lol. and who is this Samuelcool00 ?, evil twin? You can't accuse me of being this "Samuelcool00" person, because I don't spam like a noob. 3000 FanBucks was my Grand Prize. preocupate por hacer tus propias guias. I only speak english. Translate your language into english. Then ill help you with whatever your asking. hey man WHY I BANNED? have fake accounts? jaa ok.. only with 5 buth another 7 yes for friends :@... i have 3 brothers ammm SAY FAKE??? 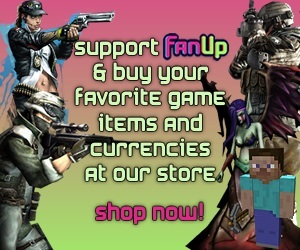 You've been a Fanup Member for 3days and you got 3k coins in 3days. Umm... Your fans are mostly all fake. It was from the fake accounts you made. Arent u the banned Samuelcool00 ? Thanks for inviting me I won't be on much.